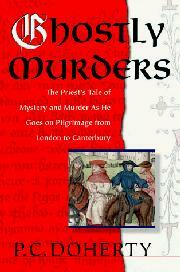 It’s the 14th century, and once again a pilgrim in a group traveling the long, hard road to Canterbury is telling a story to enliven the evenings (A Tapestry of Murders, 1996, etc.). The narrator this time is the Poor Priest, whose tale begins in 1308 when the Knights Templar, a religious order once powerful, now in disgrace, flee their London headquarters, hoping to reach passage to France. They meet a dreadful end in the woods and marshes of Kent, near Scawsby, a rumored treasure disappearing with them. Seventy years later, brother priests Philip and Edmund Trumpington are assigned to Scawsby’s St. Oswald’s Church, bringing with them old friend and master mason Stephen Merkle. Their plan is to build another church nearby, moving more recent burials to a new graveyard. But Philip soon discovers the reason for the short stays of previous pastors: the church and its environs are haunted big-time—with visions, voices, apparitions, and deaths, all seemingly to do with the long-gone Templars and buried riches. Philip is driven to make his own hard-won discoveries, involving an unexpected treasure, a trip to London, and a surprising source of treachery. One of the author’s neat twists ends this fourth in the series, but confusion reigns in a morass of quirky characters, digging forays, voices from the dead, eerie confrontations, and endless bloody killings. Unlikely to appeal to readers not enthralled with ghost stories or the history of the period.